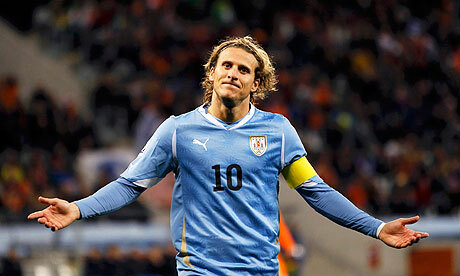 Uruguay manager Oscar Tabarez has decided to drop Diego Forlan, Golden Ball winner, from the first squad in favour of top Serie A Edinson Cavani for the crucial World Cup qualifier against Chile. Tabarez revealed he has been disappointed with a 1-1 draw against Paraguay, stating his side lacked creativity in the pitch and struggled to create chances. He said: “We need to improve a lot in what the team does when they take possession of the ball.” With this aim in view he has also decided to include Gaston Ramirez instead of Cristian Rodriguez to add possession and creativity. Uruguay are currently lying in the fourth spot of CONMEBOL table with 13 points, 10 points behind the leaders Argentina. Chile are occupying the sixth place with 12 points, having suffered four back-to-back defeats.